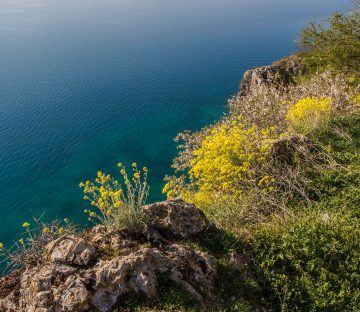 Fantastic news if you are a scuba diver, the landlocked country of Macedonia has some pretty neat diving opportunities in Lake Ohrid. 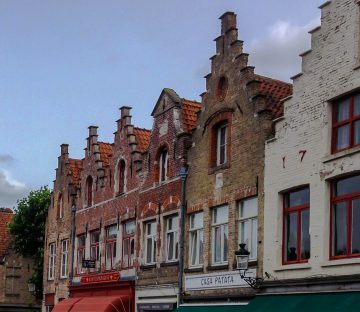 What is the Bay of Bones? 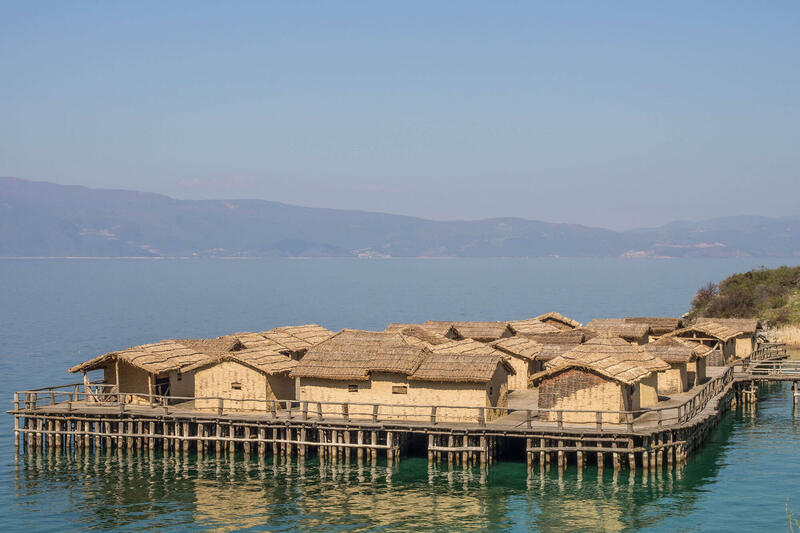 Macedonia’s Bay of Bones is a cultural landmark of reconstructed pile dwelling settlements dating back to the Bronze and Iron Age, 1200 – 700 BC. 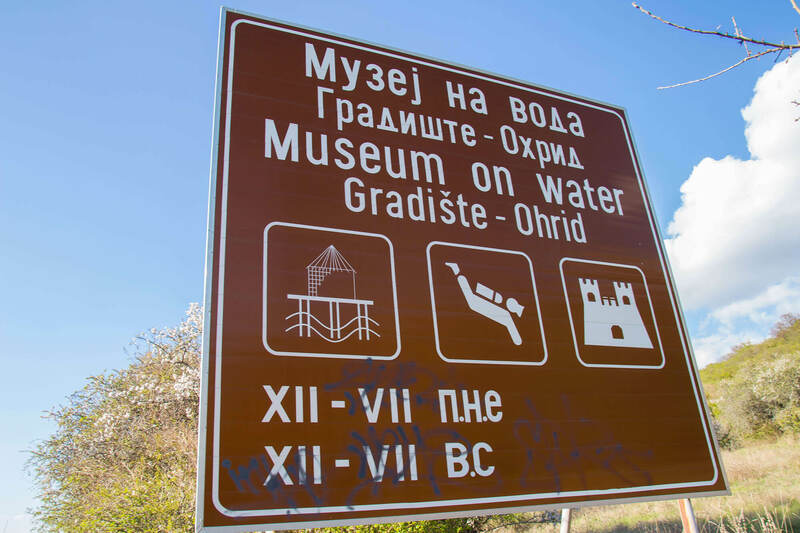 This museum on the water is located on Lake Ohrid, one of the oldest and deepest lakes in Europe. 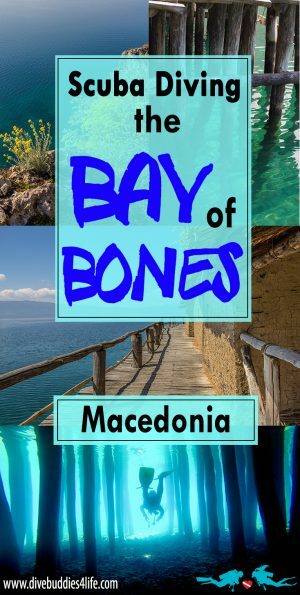 The Bay of Bones gets it name for the massive amounts of animal bones found buried in the lake bed after the underwater archeological sites discovery in 1997. 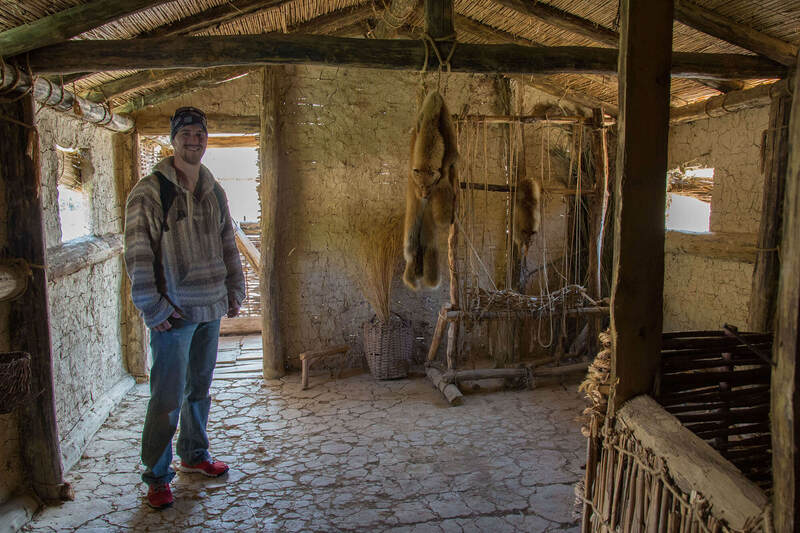 Since then, this one of a kind archaeological complex has been rebuilt as authentically as possible with a massive wood supported platform anchored to the lake bed and real fur added to the huts. 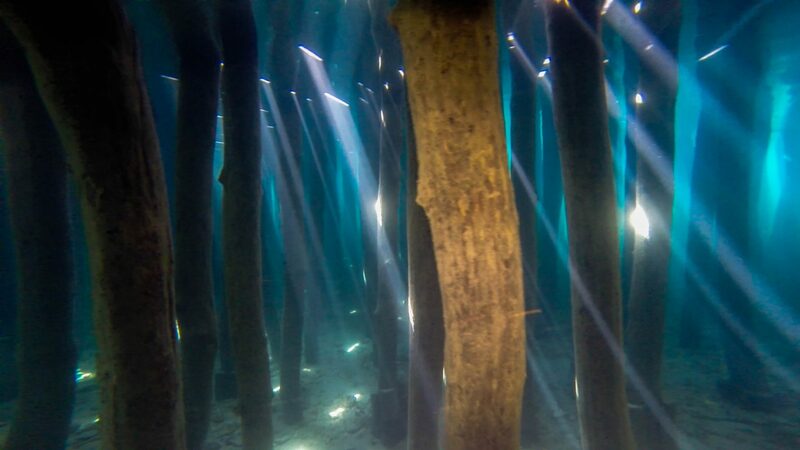 With the Amfora Dive Center, scuba divers can dip below the lakes surface and swim through the huge wooden columns that support the city. If that isn’t enough divers can also visit Plocha Michov Grad, an ongoing underwater excavation site in the flesh. There they will find pottery shards, stone and flint objects and animal bones, some of which were used as tools. It’s crazy to think that even after all these years history is still very much alive on the lake bed. Our stay in Macedonia was a short one. 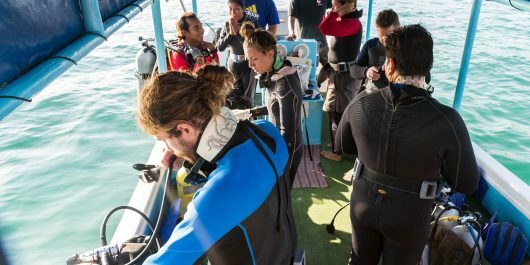 We had to be organized to make sure we got to dive the Bay of Bones. The weather worked in our favour. We had clear blue skies all week during our stay. 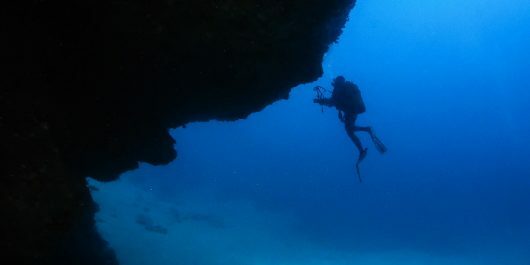 Joey contacted the Amfora Dive Center that operates on this UNESCO Heritage site well in advance. He had scheduled us in for a 10 AM Monday start. We were slightly nervous when we arrived in the parking lot for the Bay of Bones museum only to find it closed on Monday’s. 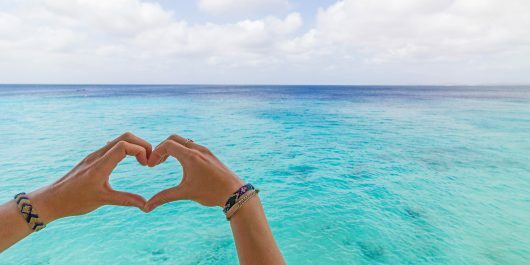 Our nervousness was short lived however because as promised the owner of the shop and our divemaster for the day arrived promptly on schedule. Once the guard let us in the gate the realization slowly dawned on us that we had the entire museum to ourselves! No crowds to compete with, no crazy tourists photobombing our pictures, we had seriously lucked out. 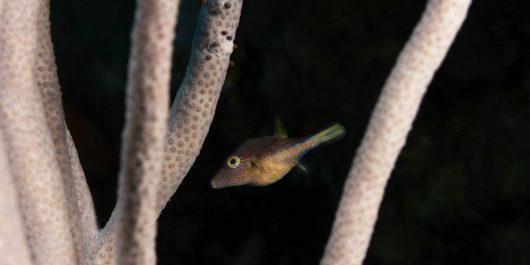 Our friendly divemaster was a very interesting and knowledgeable dude. 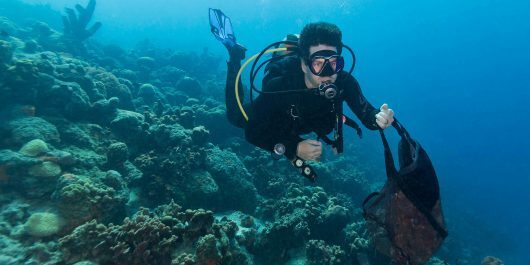 He had done some diving in quite a few different places around the world. Right from the get go he was very honest with us saying that if we expected amazing visibility and crazy colorful animals we had come to the wrong place. 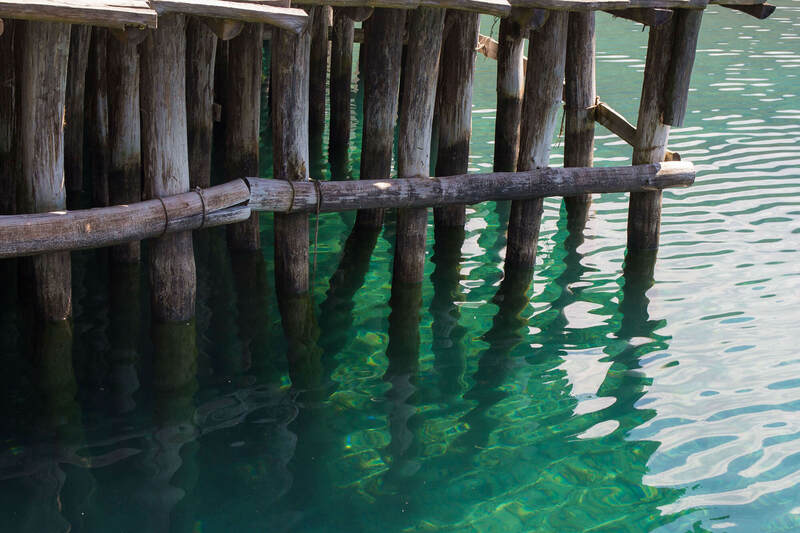 Lake Ohrid was no Carribean reef – the only thing this site had in common with the Caribbean was its waves. 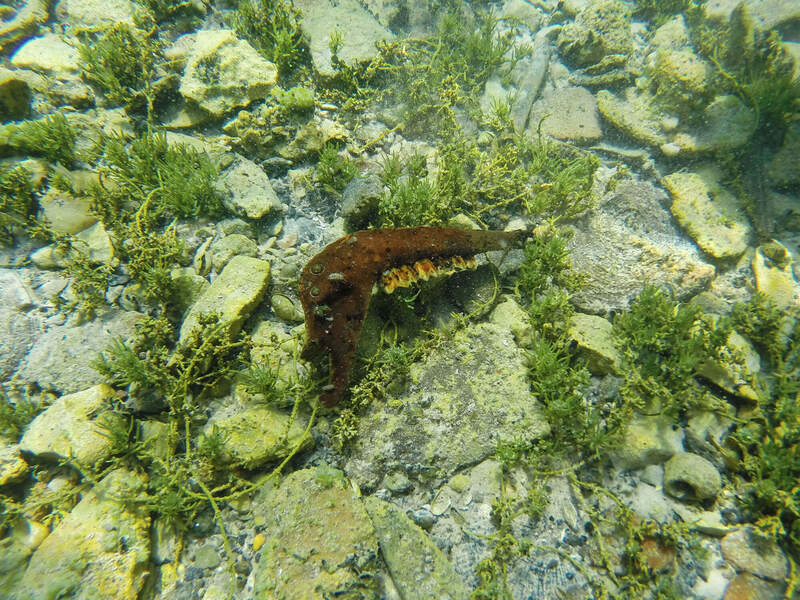 Of course the water in Lake Ohrid was not at a tropical temperature at the beginning of April, but since we had dove in much colder waters that didn’t stop us. Sporting the thickest neoprene suits in the shop we waded into Lake Ohrid with chilly reluctance. 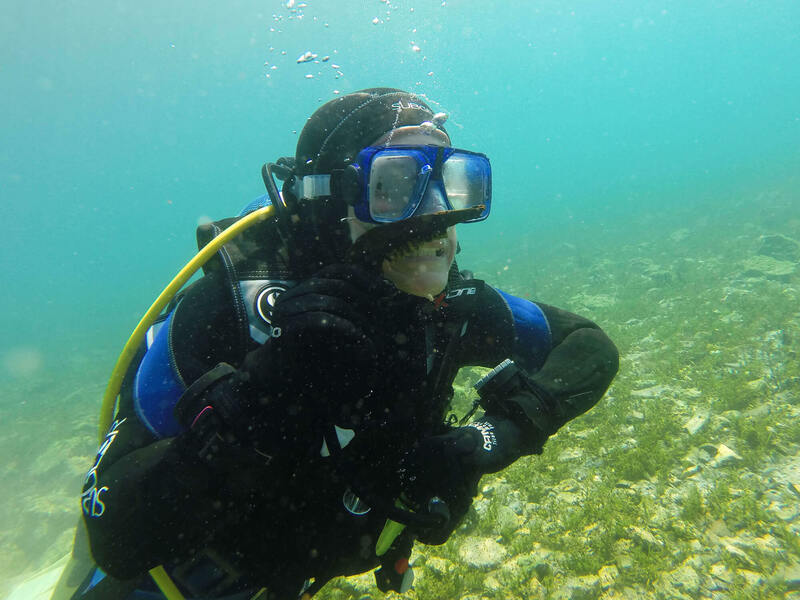 Mask on, fins on, regulator in and dive! The worst part of the dive was plunging my head underwater. The cold sneaky lake water found its way into every nook and cranny of my suit. It leaked into my neck and trickled down my shoulder and back. It took me a good minute to get my wits about me. Once I figured out my legs were still functional, Joey and I followed the divemaster just below the choppy surface. Slowly shapes began to take form around me as I saw plant life and the occasional fish dart by. 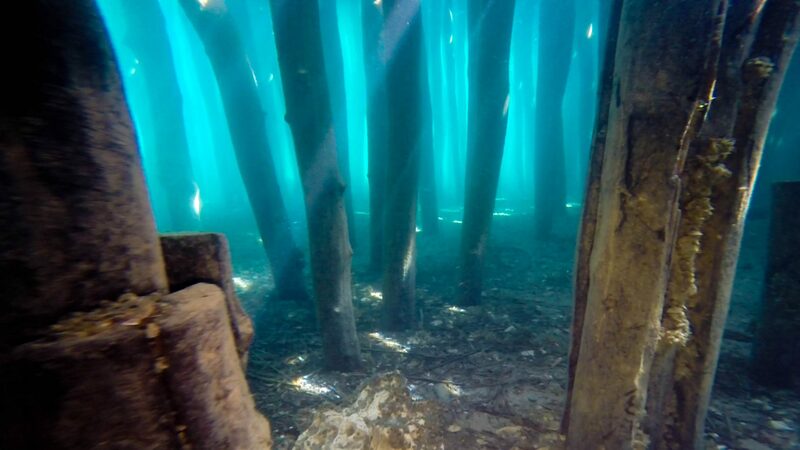 Up ahead an ancient underwater wonderland materialized from the shadows. 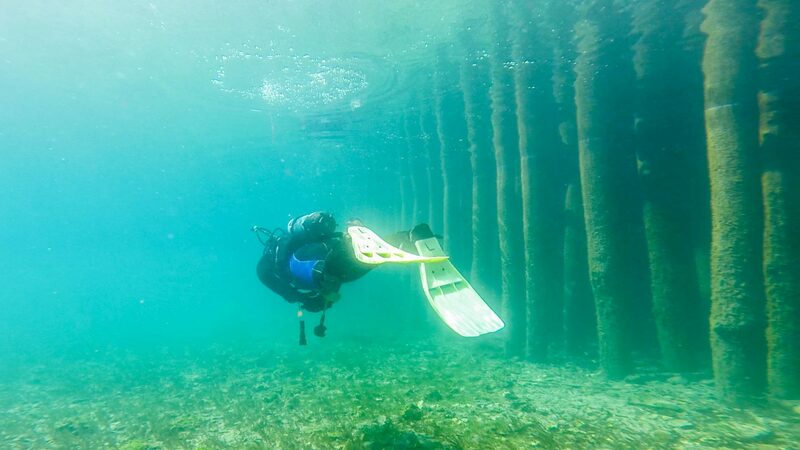 We approached the large wooden pillars of the UNESCO Bay of Bones Heritage site. Their gigantic form seemed to drop from the sky and sink into the muddy benthics of Lake Ohrid. 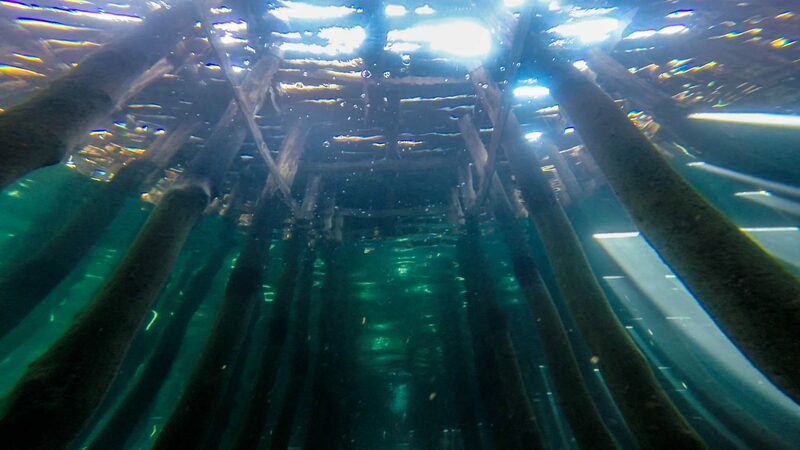 We gracefully finned under the wooden platform of the Bay of Bones. As to be expected it was dark in the shadows of the city. All around me were columns placed here and there, in an orderly grid-like fashion. As we weaved through the columns the blue waters of the lake and sunrays played peek-a-boo with us glittering like sapphire diamonds. It was as if the Bay of Bones was trying to tell us its story. We swam for about 200 meters beneath the city and came out the other side at Plocha Michov Grad. After being in the darkness for a stint of time it was almost blinding emerging into the sun. 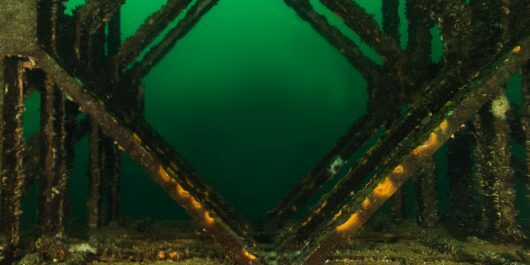 Plocha Michov Grad is the name given to the underwater archeological site found directly beside the Bay of Bones platform-on-the-water. The archeological site didn’t look like much at first glance, but after taking a closer look we could see years of history scattered on the lakebed. A scientist at heart I quickly saw many laid out square shaped quadrates. Their perfect grid like pattern sectioned off the lake bed for ongoing archeological diving and excavation overseen by the Macedonian government. We poked around the site, finding some neat looking pottery pieces and an old decaying jaw. Being careful not to disturb any ongoing work we only touched the ancient relics left for divers to play with. Obviously I felt the need to take a goofy selfie with the animal jaw, because lets be honest, how often do you find one of those underwater! As a past university science geek, it felt pretty cool to see our first underwater archeological site and watch some Macedonian history being freshly discovered. All in all, we ended this unique Macedonian dive when we started to shiver from the cold, not because we ran out of air. 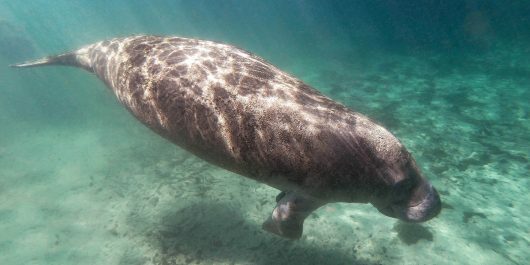 The month of April was a little too early to stay underwater for an extended amount of time. Lake Ohrid would need some time to warm up! For any prospective scuba divers looking to plunge in this spot, the most extraordinary part about diving the Bay of Bones is not the aquatic life, but the rich Macedonian history. 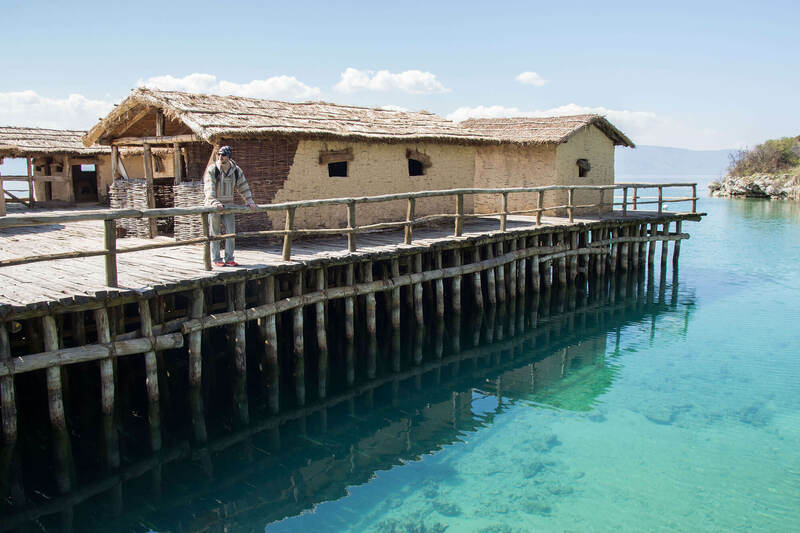 Old and ancient jaws, pottery shards and historic discoveries are just waiting to be found on one of Europe’s deepest lake beds. Cost: One dive at the Bay of Bones costs €40.00. 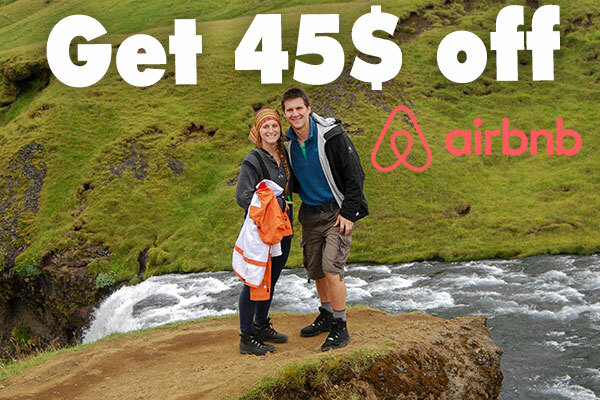 This price includes all equipment rental, entrance to the UNESCO World Heritage and a guided dive. 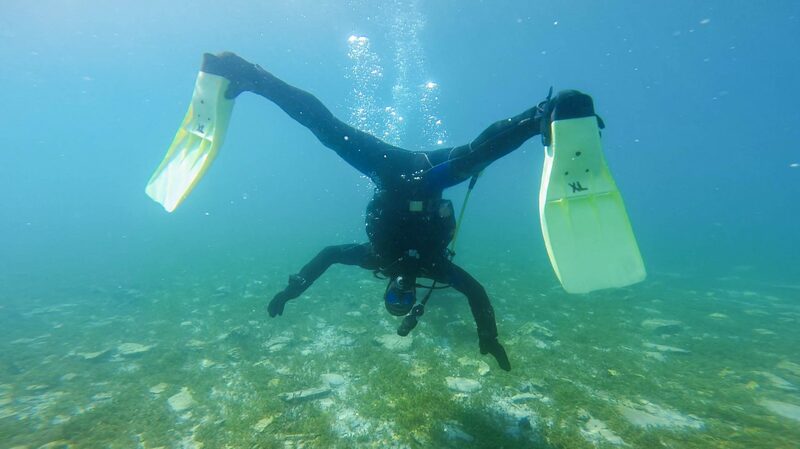 Seasonality: You can be crazy like us and dive the Bay of Bones in April when we water is still freezing and the fish are few and far between OR you wait for the typical Lake Ohrid dive season during the summer months (May-September). 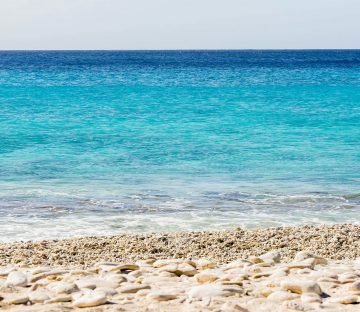 During the summer the water is comfortably warm and the shallows around the base of the UNESCO Heritage structure just fills up with little silver fish. 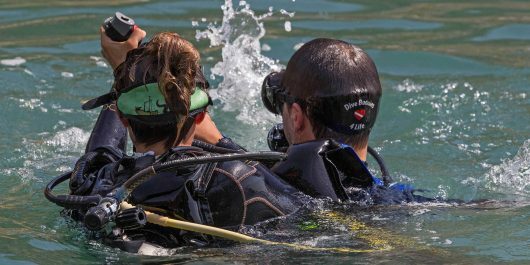 Restrictions: Diving the Bay of Bones is a pretty simplistic dive the most important thing you need to make sure you have on hand is your Open Water scuba certification. 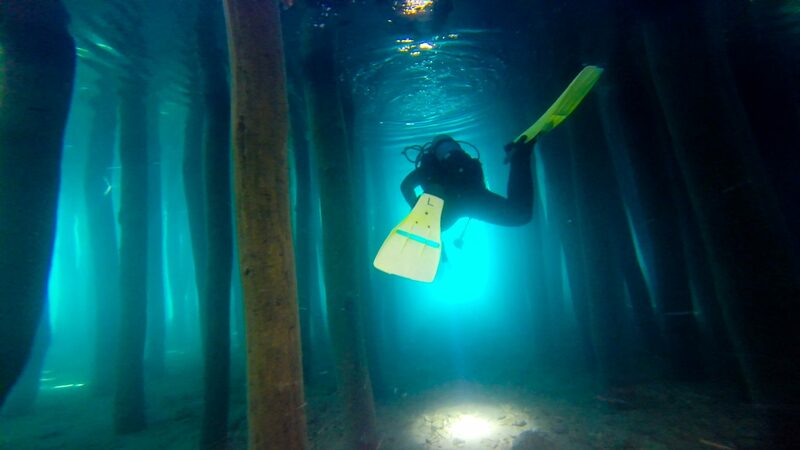 Companies: Trying to find a Macedonian scuba diving company to dive the Bay of Bones on Lake Ohrid is easy. 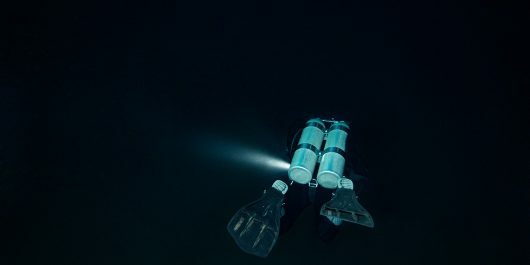 The one and only company that has permission to dive the UNESCO World Heritage site is Diving Center Amfora.